This program on International Trade and Logistics is offered in partnership with AFTRAL. Its specificity? Its unique focus on the maritime industry and expertise in the fields of logistics and business optimization. Those two years prepare students to manage international and strategic questions related to logistics as much as developing key skills (strategy, management, negotiation, …) in complementary areas which are International Trade, Transport and Logistics. 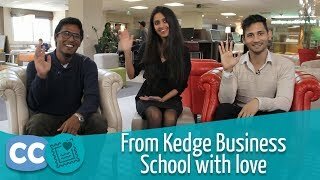 Another point KEDGE puts forward: its connection with the corporate world. You claim to be the leading French institution in training for international trade. What qualifies KEDGE to say this? The curriculum looks to be very focused on the maritime industry. Is this program only for those who will work in maritime shipping? Will you explain how the interview process, please? Thematic questions? Professional project questions? What language? I have a three-year Bachelor’s and two-years of professional experience. Can I apply to the one-year track? Quel est le niveau d'anglais qu'il faut avoir ? Un mauvais niveau peut-il être un frein à l'admission ? What do you mean by “Manager 3.0” on your site? Will we become bionic humans? What is the fast-track option for students without management courses and how does one qualify? KEDGE describes this master as “very hands on.” What’s hands-on about it? How do I get job in France after completing MSc international trade. Because as we know it is very difficult to get job in France if you can't speak or understand French. Can you tell me more about living in Marseille? Where is the campus in the city? Expert Question: How does your program take into account rapid changes in technology, and how does the curriculum prepare students to use software relevant to the transport and logistics? Can you tell us more about the study trip, please? Why Rotterdam? Do you have any university partners for the semester abroad in M1?